Ah, back to school. 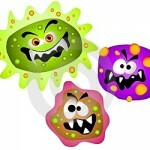 It’s a time that children fear and adults revere – that is, until the back-to-school germs rear their ugly heads. You almost forgot about those, didn’t you? 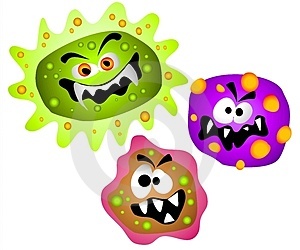 Unfortunately, schools are like breeding grounds for infectious germs. And once the kids get sick, you’re bound to follow suit. It could be a stomach bug or a nasty flu, but something is bound to come your way sooner or later. Your best defense is to keep your kids as healthy as possible, so they don’t fall victim to the latest bug that’s going around. Start getting strict about bedtime again – Many parents relax the rules a bit during the summer because there’s no need to get up early. But it’s important to remember to get back into your old routine with enough time for kids to adjust. Enforce a school-ready bedtime about a week before school actually starts. Review the rules of proper hygiene – If you haven’t addressed this in a while, now’s a good time for the lecture. Make sure your kids know that they should always wash their hands after using the bathroom and before they eat. Be sure to sanitize their cell phone, where a lot of germs hang out. Stock up on vitamin-C-rich foods – Vitamin C is a powerful antioxidant and immune system booster. Give your kids more oranges, strawberries, cherries and kiwifruit. Encourage exercise – The week or two before school is not the time for television and video games. Encourage your children to go outside and play and they’ll be less likely to get sick later. Zinc it up – Zinc increases the body’s ability to produce white blood cells, which fight infection. To get more zinc in your kids’ diet, make more meals that include beans and look for zinc-fortified cereals. You can follow me on twitter at @deborahenos. Glad you are enjoying my blog! I liked this blog very much. Whenever school starts for my three kids, I get tensed a lot. They always come down with a bout of flu when they go to school. I liked these tips very much. I will adopt these for my kids. I do give them a lot of vitamin C, but find it difficult to keep them away from flu. I get worried for my 2 kids aged 7 and 4 respectively every year when they go back to school after summer break and often fall sick with stomach bugs that results in missing school and studies in first 2 weeks.Instead of relying on medicines,I was looking for some solution to strengthen their immune system naturally and looks like your post has come to my resort. Very informative blog. I think most of the parents are worried about their kids safety. I am too sailing in the same boat. My kids also come down with flu most of the time. My third daughter is quite weak and she catches cold very often. Now I am scared about swine flu also. Thanks for this article.